Our curriculum is based on the philosophy that children learn best through hands-on activities that address the needs of the child, while fostering a joy for learning through sensory-based experiences. 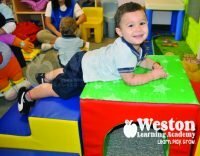 It is our experience that utilizing these methods supports the child’s social-emotional, physical and cognitive development. Our curriculum includes tools, colorful visual aids, and hands-on projects. Children can participate in many different creative ways even if their communicative skills are limited, this creates a safe and encouraging environment for children with diverse backgrounds. Our curriculum reflects the belief that children need a balance of child-initiated and teacher-facilitated activities each day. This approach reflects the beliefs of Jean Piaget, Erik Erikson, Lev Vygotsky, David Ausubel, and Jerome Bruner. Themes are used to introduce information and learning takes place as a child explores and manipulates real objects and events. We also offer a bilingual (Spanish) curriculum. Our academy is staffed by carefully screened teachers who add their own special touch to your child’s development. Our curriculum and daily activities build communication skills, a positive self-image and self-confidence all while educating how to share and consider the feelings of others. 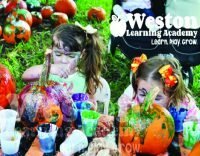 Weston Learning Academy understands just how important it is to select the right preschool/daycare for your child. That’s why we nurture each child as a special individual and why we are committed to creating a loving environment where children can learn and grow. Your child is unique, so is the way he or she will learn, play and grow. Our staff’s loving care and our bilingual curriculum are both tailored to meet the individual, emotional and intellectual needs of your child. At Weston Learning Academy we take pride in preparing our children for a brighter future. 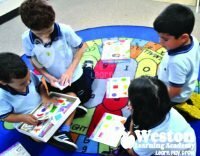 Weston Learning Academy provides children with an environment in which they feel comfortable and eager to explore and learn new things.